For genealogists and researchers, diaries can be very enlightening sources for family history and insightful of the character and personality of the diarist. One of the problems, however, is that not many who kept a diary were particularly insightful, often relating too much about the weather or letters they wrote, and very few details of interesting events. Perhaps the main problem with diaries is that there aren’t very many of them. The Kelley House Museum archives, for instance, has only four. Not long ago I was given the assignment to transcribe one written by a farmwoman. “Wouldn’t it be nice to know more about the life of a Little River farmer’s wife in 1938?” it was suggested. I was told the diarist was Edith Kent, one of eight children of Nathaniel Kent, whose father, William Kent, acquired land in Little River around 1854 while he was working for the first mill on Mendocino. The Kent Ranch operated for many, many years as a large dairy and chicken farm. Whenever you are on Highway 1 driving past the long row of eucalyptus trees on the east side and a vast open field with a large old barn or two on the west side, you will be traversing the original Kent property. The family house, the pale green structure on the east side of the highway, still stands. Much of the property, now called Spring Ranch, is owned by California State Parks. The house is a vacation rental and the barn is a venue for big social events, such as weddings. From the very start of this transcribing project, my curiosity was paired with suspicion about Edith and her diary. It seemed increasingly odd that there was no mention of familiar Little River names, but plenty of names that didn’t resonate as being from Little River. The first men she named, Herman and Bud, I surmised were the hired hands on the farm. More bewildering was that she often mentioned “Dad” working on the farm. A little checking of Edith’s biography revealed that her father, Nathaniel Kent had died several years before the date of this diary. So perhaps she called her husband Dad, not uncommon for some folks of that time. Edith’s biography also said that she and her husband, Fred, had a son named Gary. The diarist mentioned three girls, two of whom were school-aged, but there was never a word about young Gary. As I continued transcribing, many people were referred to as “Uncles”, far more than the Kent family had. But, I reasoned, perhaps the term Uncle was for those fellows who were particularly dear to the family. Since too many things weren’t adding up, I stopped transcribing before even starting on February and just thumbed through the diary pages. The aha! moment came when an entry in July stated that Dad had been elected the Grand Master of a new grange. 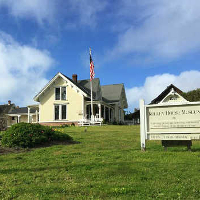 Thanks to the online search site Newspapers.com, I found several articles that explained all about the new grange in Anderson Valley, the celebration of the election, and most importantly, the real name of “Dad”: Frank Cook. A little more research produced his wife’s name, Ella. And then, searching a little deeper revealed much more of the family history, including their children, parents, and all those Uncles, who really were uncles! A newspaper article even explained the week in the diary with nothing written: Ella and Frank had gone on a trip with the family. The mysteries solved, but my curiosity still piqued, I continued reading the diary to get a sense of this farmwoman’s life. It’s easy to imagine Ella Cook putting on an apron every morning and keeping it on for the rest of the day. After making breakfast for her family (husband Frank, daughter Bonnie and sometimes daughters Cleone and Clora, son Wilson, and Mrs. Mendosa, a boarder and local teacher, and a few hired hands) she started her daily chores. She raised chickens, geese, and rabbits. Most were sold, some were dinner. On a particularly rainy day in April, she rescued 12 young geese from the downpour and brought them into her kitchen for the day. To curb the rodent population, Ella put out “rat lunches” in the farm yard but never described what they were, perhaps a lethal concoction of her own invention. She gathered, cleaned, sorted and crated the chicken eggs every day, often as many as 80, and in July 300 were delivered to a store. Several times a week she cleaned the animals’ pens. The farm also had sheep and one cow, whose cream she churned into butter, along with vegetable gardens and peach and apple orchards on their property and neighboring land. Dried apples were the main source of income for the Cook family. Apple picking started in August as well as gathering wood for the fruit dryer and collecting windfall apples, also called grounders. The family picked and peeled apples for drying well into October. Besides preparing all the meals, Ella often baked. A caramel cake is mentioned several times and must have been a favorite, whether or not for a special occasion. Another popular treat was something called Cheese Dreams, but she left no clue about the recipe. Cleaning the house and washing and drying laundry were Ella’s ongoing chores. She lamented having to dry things around the fireplace on rainy days. She was particularly grateful and proud to have an Electrolux vacuum cleaner, a Christmas gift in 1937 just before she started this diary. Ella had a premonition in May: “All day I have felt that something is wrong.” She never again wrote of another such feeling. Her last diary entry is Monday, October 31, 1938 with no hint or explanation for not continuing. If you have family diaries, please consider donating them to the Kelley House Museum. The Research Office is open weekday afternoons at 45007 Albion Street in Mendocino.